Days of Our Lives: Stephan was finally arrested! But not for what we all expected, it was treason of all things. Stephan was indicted by the grand jury for hacking Steve’s bionic eye to steal ISA secrets. I swear no one can make a storyline like Days of Our Lives writers. Yes we have a lot to cover this time; between Hope out to get Ben, Ciara being forced to accept Ben’s past, Xander trying to get back in his family by force, Melinda blackmailing Abigail, Chad becoming DiMera’s new CEO, and Eve being well Eve, grab the popcorn folks because we are just getting started. Where to begin? Hope will not rest until Ben is behind bars along with Stephan—even if that means cutting a deal with sleazy Ted to represent Stephan in exchange for his testimony against Ben. But we are not even sure that Stephan will betray Ben when all he has shown was loyalty. I mean until Ciara found out that Ben kidnapped Gabi on Stephan’s behalf. It’s on fun and games until the truth comes out—and honey did the truth pour out. Ben had no choice but to rectify Ciara’s wavering heart, he went to Stephan and quit, once and for all; however, that shadowy figure was actually Chad—Stephan’s new CEO replacement. Ben’s still out of a job though, Chad had no intention to keep Ben on the payroll. If only Ciara could have given Ben a chance to let her know he chose her over Stephan. Well, none of that matters now that the cats out of the bag on his and Claire’s plot to break her and Tripp up. As if Ciara didn’t have it hard enough trying to love a murderer, now add manipulation and the choice seemed to make itself. It wasn’t much of argument in the end, it was more of Ciara yelling at Ben, and of course, she would yell at him about his first ever misunderstanding—go figure. When she was done yelling at him, he didn't even bother to clear his name, by that time his ego and insecurities were talking for him. I almost felt bad for Ben, seeing how hard he’s trying to show how he’s a changed man. But no one can forget about how he strangled Abigail’s cousin, killed 2 women, and tied Abigail to a bed then proceeded to light it on fire. Well, no one but Ciara of course because now she’s miserable and even booked a flight to South Africa. Meanwhile, Xander is back in his house and he’s demanding Victor make him CEO of Titan. He has some insider secrets and wants the title and the power that comes with his last name—and no he cannot be bought, Victor already tried. But of course, Leo would overhear this conversation, as if he needed more leverage in this household. Now Leo is offering up some goods if Xander will offer up his goods first—ever here of Pay for Gay because I haven’t until now—but I’m dying to see what Xander will choose. Can Sonny and Leo move out and get their own place because the longer Leo remains there, the further his fangs will seep into this family’s business—but I am here for the mess. As if it couldn't get any messier, DA Melinda drops by Abigail’s home to offer some friendly professional advice on charging Gabi; oh did I say friendly, I meant blackmailing her to take down Gabi or suffer the consequences of Chad being indicted instead—so much for being on the right side of the law. Melinda was an absolute hot mess . She remains very cold towards her sister, Hayley, and at a time when Hayley needs love and support from her family—I mean she just recently tried to commit suicide on the job. If it wasn’t for JJ, I don't know where Hayley would be, if only Melinda would allow her to trust him. Speaking on not trusting people, Eve is still trying to coerce Jack to embrace his dark side; which seemed to almost work once Jack found out that he raped Kayla after he found out she cheated on him with his brother. But I don't think she was prepared for Jennifer and Jack’s connection. Even with Jack’s memories out of the picture, his subconscious is still very much in love with her—even if he doesn’t realize it yet. And when Chad paid him ten grand to have a family dinner, we could all tell how much he enjoyed being around people who actually loved him. And at the very least he remembered that Romeo and Juliet verse—baby steps my friends, baby steps. That dinner definitely had its highs and lows. I know I am not the only person who loved when Abigail told him off, protected her man’s character, and then proceeded to still give him a kiss on the cheek—showing how at the end of the day that’s her father and he STILL means the world to her, even if he can’t remember that world. Chad seemed to be on a role as a loving husband, because he definitely tried to get rid of Eve by offering her a dream job as Senior VP of DiMera Enterprises in Paris, France. This was definitely a juicy week filled with love lost, love gained, and tons of blackmail. I mean would it even be the show that we know and love without blackmail at every turn? But I could’ve lived without seeing Gabi cry over JJ not wanting to be with her after everything she did to his family. I don't know what was worse, her thinking she still had a shot with JJ or her crying. If you’re going to be a villain, leave the tears at the door. We won’t see Eve crying over her evil deeds, because real villains accept their choices and never looks back. Speaking of never looking back, will Eve go to Paris and leave Salem for good? Will Stephan turn on Ben? Will Jack remember more than a Shakespeare verse? And what the heck is Hayley’s secret? And this is why we keep coming back; until next time. General Hospital: I definitely thought Laura was going to be Kevin’s next victim, but it seems like she was saved by Scott. Yes, Port Charles still has a killer running around and the police are just now starting to connect these killings with Ryan’s murder spree. I swear, they are profiling the killer to fit Kevin’s character but no one has the idea that maybe it is his brother—I should take Commissioner Jordan’s job myself. The police have finally realized that Ryan would keep all of his victim’s drivers licenses and now the copycat killer is doing the same. If only Kevin was acting weird and suspicious, like maybe not wanting Laura to help the mentally ill at Fern Cliff. Or having no real reason to drop Franco as a client. It’s not like dropping his entire life and career at Port Charles to leave with Ava—yeah nothing suspicious at all. I’m actually terrified for Ava because she’s been so emotionally unstable lately, and when she finds out that she’s been sharing a bed with her daughter’s killer I don't know what she will do. But with Oscar’s test results I have to portion out my sympathy. Looks like Oscar’s tumor has not shrunk and his condition remain inoperable. But I am so glad that Kim and Drew decided to tell Oscar his test results ASAP. Drew never been more right when he said they couldn't wait to tell him, “one day becomes a week, and a week becomes a month”. And of course, after news like that Alexis would stop by Kim’s office to clear her name and suggest that Julian to get cut some slack. But I’m not going to lie, I loved how that scene went from a total catfight to a much-needed conversation for Kim; she was able to break down and Alexis got to show her support and comfort skills. I am all for women supporting women. Kim needed to unload her thoughts on someone; she’s been in the strong mom role for far too long and it was starting to even look exhausting. Like when Joss’ mom shared some of that burden. Joss was falling down the rabbit hole of denial, ready to drive herself crazy looking for an alternative cure for Oscar. But I completely understand, I’m not ready to let go of Oscar either—so we are going to need a miracle from GH writers like ASAP on the double. And the drama continues with Shiloh/Hank/David—and yes those are all his names. Turns out that Hank/Shiloh is actually Sam’s old mark, I mean husband’s son. Back when she went by her alias, Linda Black. So Shiloh/Hank/David had a history with both Drew and Sam. Do you guys think him living with Sam’s sister, Christy, and Drew’s son, Oscar, was a coincidence? And I mean what grown man takes in minors without talking to the parents. I definitely don’t trust anyone with more than 2 names, and I don’t believe in more than one coincidence—or is that just me? Plus, Day of Dawn seems really creepy and why didn’t Shiloh/Hank/David answer Joss’s question: “what do you do?” We know what Day of Dawn does, but what is this guy’s bread and butter? What does he do? Especially after we find out that he blew through his trust fund and Sam stole all of his family’s money—for her brother of course. There was some good news this week. At first, Cam’s court case looked bleak when we found out who the judge was going to be. But after his mom told the truth about the drug charge, how he only bought the weed to give to his terminally ill friend so he could develop an appetite, things seemed to look better. Especially when Drew stopped by the courthouse to speak his peace. But Cam’s hearing wasn’t the only bit of good news; Laura won the elections and is now Port Charles’ new Mayor. Looks like Kevin might have a harder time killing her than we thought. Even though the writers were doing their best to foreshadow some good ol’ fashion strangulation in her future—what a personal way to kill someone. Can the police hurry up and connect the dots? Or is Franco going to stumble across his box of trophies—the IDs—either way, Kevin needs to rot in jail for killing KiKi and destroying Griffin’s faith. After KiKi’s death Griffin’s faith has hit an all-time low; however, in all of his pain and anguish, he is still praying in Church, hoping he even in his darkest time, he can be saved. Kevin’s list of victims is growing by each passing day. Will justice find him, will Ava say yes, or will Franco stumble across his box of secrets? In the end, I’d take Kevin getting away if it meant we could keep Oscar. I guess we’ll have to wait on the miracle like everyone else—until next time. Performer of the Week: Coby Ryan McLaughlin as Shiloh/Hank/David. With all the revenge his character has brewing, Coby still manages to wear the nice guy mask so well he almost fools the audience. 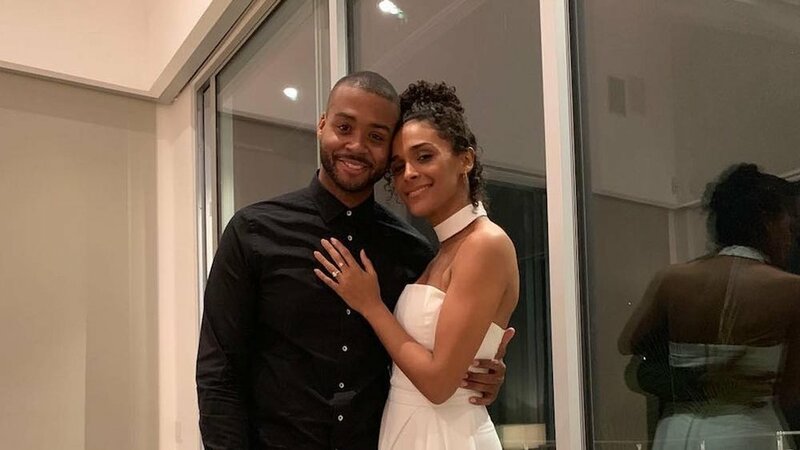 News of the Week: Looks like we have a real-life wedding to get ready for, Briana Nicole Henry, who plays Jordan, just shared an Instagram post of her and her new fiancée. It’s a beautiful thing when life imitates art. Guess Briana’s fiancée thought she looked too beautiful in that wedding dress to let the moment pass him by.